The Si badge has been synonymous with sporty Hondas since the 1980s. At the time, it designated the most powerful versions of the Civic Hatchback, the CRX and the Prelude, and although the cars’ output was far from spectacular, they were light, nimble and affordable. The Civic Si is still with us today, more than 30 years later. Can we call it an iconic vehicle, in the same vein as the Volkswagen Golf GTI, which pioneered the Hot Hatch revolution back in the Seventies? It’s debatable, but the 2017 Honda Civic Si undoubtedly keeps the basic recipe intact. The Si hasn’t always been the performance champ in the Civic lineup. Right now, it’s the 2017 Honda Civic Type R that’s standing in the spotlight, casting a shadow on the Si that was reintroduced to the market after a skipping the 2016 model year. Available in coupe and sedan body styles, the Si is equipped with a turbocharged, 1.5-litre four-cylinder engine that produce 205 horsepower as well as 192 pound-feet of torque between 2100 and 5000 rpm. The only available transmission is a six-speed manual, which sends power to the front wheels. This is currently the most powerful sub-two-litre engine on our market. Over the years, Honda frequently offered small-displacement powertrains with VTEC variable valve timing that were high on horsepower, but low on torque. However, this little mill gets plenty of it, although it doesn’t peak as early as is the case with the GTI’s 2.0 TSI, which unleashes 258 lb.-ft. at just 1500 rpm. The result is a 0-100 km/h time of about seven seconds, which is fast, but not that speedier than what the previous-generation Si could muster with its naturally aspirated, 2.4-litre engine. It’s a little slower than the 220-hp GTI, the 252-hp Ford Focus ST and the 268-hp Subaru WRX, but it beats the 201-hp Hyundai Elantra Sport and Kia Forte Koup SX cousins by a small margin. What we do get compared to previous generations of the Civic Si is more mid-range torque, which means we’re no longer constantly rowing through gears to gain some speed. Some will like the extra flexibility of the powertrain for the daily drive, some will miss the extra effort required to squeeze out maximum performance. On the other hand, and not that it was a main concern in a performance-oriented car, but the 2017 Honda Civic Si boasts city/highway fuel economy ratings of 8.4/6.2 L/100 km. That’s two litres less on the combined cycle (7.4 vs. 9.4) compared to the previous-generation Si, and also less than all of its aforementioned competitors. We ended up with an excellent average of 6.8 L/100 km during our test, although the car required super unleaded. Our Civic Si Coupe was also quite a handler, with its stiff suspension, bigger stabiliser bars, precise steering and P235/40R18 tires. The car’s limited-slip differential also helps keep torque steer under control. The only thing missing here is a more aggressive exhaust note. 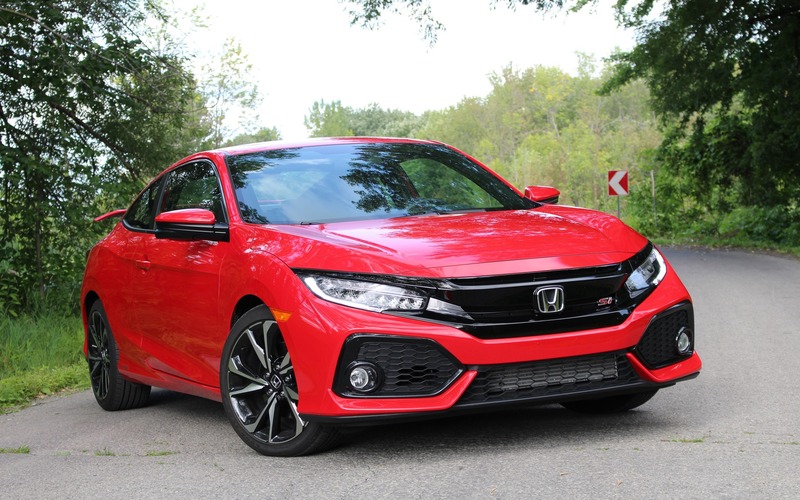 The Si comes standard with a good list of features such as an intelligent key system, a power sunroof and a 452-watt stereo, but doesn’t include the Civic Touring’s power-adjustable seats or leather upholstery. Instead, we get grippy fabric wrapped around heavily bolstered sport seats, along with red contrast stitching and the usual Si logos sewn into the backrests. The centre armrest and cupholder combo is cleverly designed, but some extra padding and smoother fabric would be nice. Climbing into the back of the Coupe is an expected challenge, but once we’re sitting down, it’s fairly comfy. If we have kids or carpool on a regular basis, the Civic Si Sedan is obviously the wiser choice. Despite the wheel-mounted buttons, we’ve lamented the lack of a physical volume knob in the Civic already, and that hasn’t changed in the Si. The infotainment system offers plenty of features, but the screen isn’t very responsive to finger poking, and the button zones are small and tightly bunched up together, so it’s really easy to press the wrong button while driving. At least there’s Apple CarPlay and Android Auto integration, and the radio channel you’re listening to gets recorded while you’re talking on the phone. Dual-zone automatic climate control and heated front seats are standard, but if we want to manually set fan speed and ventilation modes, we have to use the touchscreen, making it a multi-step process. Give us a real blind spot monitoring system instead of the annoying LaneWatch camera, which only works on the passenger side of the car anyways. A minor detail, perhaps, but when we lock the car, the fuel filler door makes a loud and awful clunking noise as it too gets locked. Very un-Honda-like. The 2017 Honda Civic Si starts at $28,490 for the sedan and $28,890 for the coupe, before freight and delivery charges. Sorry, there’s no Si hatchback, and that’s a shame. We’ll get more performance from the $30K GTI and the $34K Focus ST as well as all-weather grip—but less refinement—from the $30K WRX. The Elantra Sport is the bargain of the bunch at $25K and fun to drive, but not as much as the Civic. As for the Forte Koup SX, it’s only available with an automatic transmission, which spoils the fun. 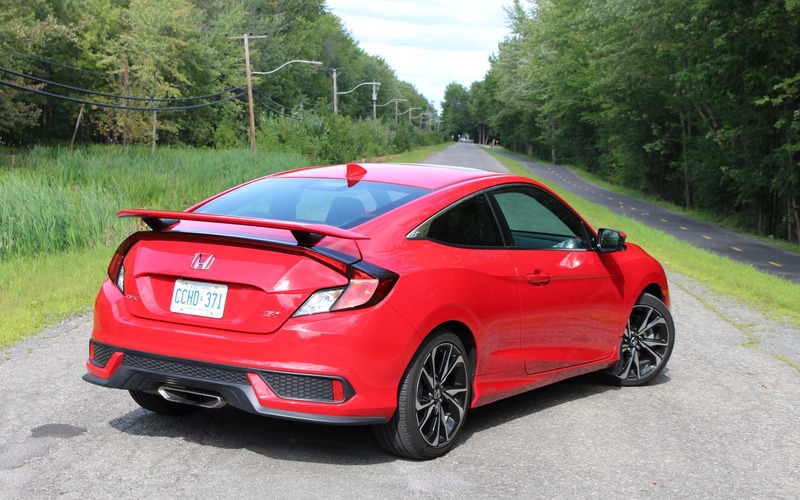 As it did more than 30 years ago, the Civic Si continues to provide cheap thrills behind the wheel, but with more comfort and convenience features and improved mid-range performance. Sure, the mighty Type R might get our blood boiling, but for the daily grind, the Si is a more rational choice. 9/10	The most fuel efficient of its category. 7/10	A decent ride despite the sport suspension. 7/10	Not a sharp as a GTI, not as wild as a WRX, but a fast and nimble car nonetheless. 6/10	Lots of features, but the user interface needs work. 7/10	Excellent handling, especially for a front-wheel-drive car. 8/10	The Si is back, and it’s better than ever. Test Drives 2018 Honda Civic Si: Sports Car or Fast Economy Car?